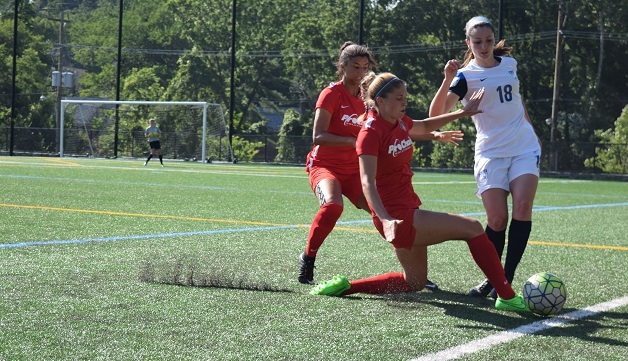 Boyds, MD (June 21, 2017) – The Washington Spirit Reserves earned a 2-2 draw against Braddock Road Stars Elite on Wednesday, June 21 to improve to 3-0-1 and remain unbeaten through their first four games of the 2017 Women’s Premier Soccer League (WPSL) season. Former University of Virginia standout Gloria Douglas netted both goals for the Spirit Reserves, scoring six minutes into the first half on an assist from Lana Spitler, and then again six minutes into the second half with a strike assisted by Sydney Arnold. After Douglas put the Spirit Reserves up 2-0 in the 51st minute, Braddock Road battled back with two unanswered goals to ultimately salvage a point. Prior to Wednesday, the Spirit Reserves had won each their first three games by multiple goals. The team opened the season with a dominant 4-0 clean sheet win over Legacy – Williamsburg 76. Two goals from Meaghan McElligott and one each from Douglas and Megan Carroll paced the Washington attack. In their second game of the WPSL season, the Spirit Reserves defeated Braddock Road 3-0 in an away game at Robinson High School in Fairfax, Virginia. Douglas scored a goal and assisted McElligott on another in the victory, while current Georgetown University player Paula Germino-Watnick also netted her first of the season. On June 9, the Spirit Reserves won their third straight game with a 3-1 come-from-behind victory over Fredericksburg FC. After FFC took a 1-0 lead in the 22nd minute, Washington’s defense held strong the rest of the game and the attack posted three unanswered goals, starting with a 36th minute equalizer by Carroll which led to a 1-1 deadlock at the half. Only seven minutes into the second half, Spitler netted what proved to be the game-winner, and Sadie Stark put the game completely out of reach in the 87th minute with an insurance goal. The Spirit Reserves will look to extend their season opening unbeaten streak to five when they play next on Sunday, June 25 in a home game against Virginia Beach City FC. Kickoff at Stone Ridge School of the Sacred Heart is set for 5 p.m.